SailfishOS should need no introduction, but just in case someone doesn’t know about it, it’s the successor of MeeGo developed by Nokia and Intel so to speak, i.e. it’s a proper GNU/Linux system, with a cool and efficient swipe based interface built on Qt, it uses a few SUSE technologies such as libzypp and Open Build Service and it sports an Android runtime, that lets you run most Android apps. In short: SailfishOS is made of awesome. Until now SailfishOS has only been available on sub-par hardware, and sometimes devices haven’t really been available for purchase at all. But since yesterday you can buy a SailfishOS image for the Sony Xperia X (single SIM model, F5121). I installed it yesterday and so far it’s an amazing experience to run SailfishOS on pretty decent hardware, and the standby battery time appears to be through the roof. The instructions for unlocking the bootloader and installing SailfishOS are a bit lengthy and technical and for the time being it requires access to a Microsoft Windows PC, but I managed without much hassle, and so can you! UPDATE: Official installation instructions for Linux were published now. In other news the Librem 5 crowdfunding reached it’s minimum goal, so overall it’s been a great couple of days for GNU/Linux on mobile devices. A few days ago the Intex Aqua Fish became publicly available. This is the first 3rd party phone officially running SailfishOS from Jolla. I’m told that build quality and camera are pretty decent, especially considering the price. The performance is very good, as you would expect, SailfishOS 2.0 is running very smooth even on the Jolla Phone which has much lower specs than the Intex Aqua Fish. Proper GNU/Linux system underneath including use of SUSE technologies like libzypp, zypper and Open Build Service. It’s based in Finland and started by ex-Nokia people. Recently Jolla sold a few hundred identical phones aimed at the developer community, but they sold out in a matter of hours. So for the time being the rest of us not in India, are left jealously waiting for the Turing Phone to become widely available or for Fairphone to officially offer Sailfish as an option. Or hoping for Intex to start offering the phone globally, or for some other entrepreneurial people to start exporting it. Since the Jolla tablet isn’t widely available, there’s not much point in giving a lengthy review, so I’ll keep it short. The packaging is very slick and smooth. The tablet casing is plastic, but the build quality feels quite solid nevertheless. The display is very crisp and beautiful. At 7,85″ and 384 grams the physical dimensions are perfectly balanced. I can hold it in one hand quite some time before getting tired. SailfishOS performs extremely well on this tablet. 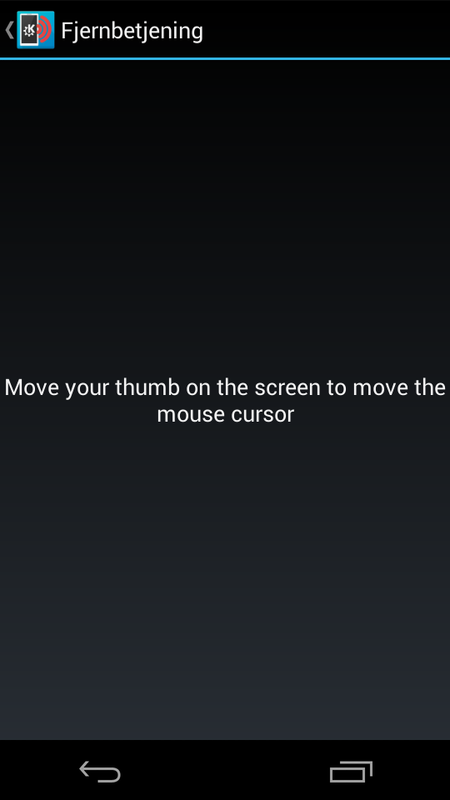 I had been wondering if the excellent gesture based UI which encourages one-handed usage would work as well on a tablet as it does on the phone. But it most definitely does – anything is only a flick of the finger away. Of course not everything is perfect, the default web browser is a bit more crashy than it is on the phone, and far from all the native SailfishOS apps have been ported to the Intel based tablet – understandably so given the number of tablets in circulation and of course you can run most Android apps via the Android runtime. Another ill side-effect of the tablet is that it is so great that it makes the Jolla phone feel a little slow and crammed in comparison. Speaking of the phone, it’s been well over two years since I bought and I still couldn’t be happier with it. Luckily more SailfishOS devices are to be expected very soon like the Intex Aqua Fish and Turing Phone. And Fairphone 2 and Mi-Fone also on the horizon. Hopefully for the rest of you, another SailfishOS tablet will also become available fairly soon. Today happens to be my birthday, I’ve taken some days off work and there’s a lot of good stuff going on. Earlier today Richard Brown informed that the planned merge of Tumbleweed into Factory has been completed. So starting from today the “old” Tumbleweed is dead, and Factory will continue as a rolling release distro under the name openSUSE Tumbleweed. As a birthday present I got the Keira Black Other Half from the Jolla Store for my Jolla. Which of course isn’t just a cover, it’s a smart cover which also adds a cool ambience including ringtones etc. 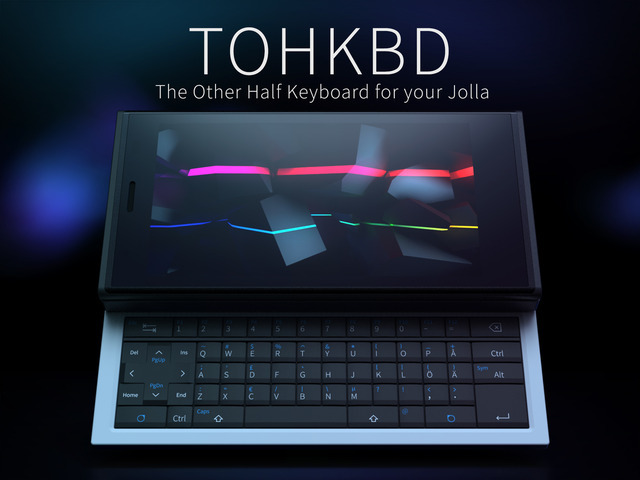 The Kickstarter crowd funding campaign for TOHKBD (The Other Half Keyboard, scroll down on the link for videos and more). A physical QWERTY keyboard for the Jolla smartphone, has kicked off today, and so far gotten off to a flying start. Of course most importantly openSUSE 13.2 was released minutes ago. This is the first release based on the stabilized rolling release distro Factory (well, Tumbleweed, starting today). It features a greatly improved installer, Plasma 5 as a tech preview, QML based NetworkManager plasmoid, Btrfs+XFS as default filesystem. See here for a detailed list of new features. Also the nice and stable, feature frozen KDE 4 workspace should be mentioned. A lot people who used KDE 3.5.x back in the day, will remember the joys of a stable and feature frozen desktop environment only getting bugfix and polish. Also 13.2 comes with a new, light coloured desktop theme. 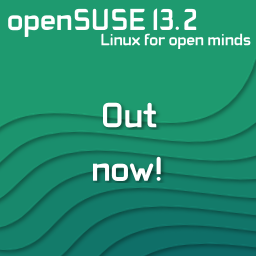 Of course openSUSE-Guide.Org has been updated for the 13.2 release. And, as always, remember to join our community and help make 13.3 even better than 13.2! Over the course of the last several months a lot of changes were made to the development process for openSUSE Factory. Meaning it’s no longer a highly experimental testing dump, but it’s now a viable rolling release distribution in its own right. You can read all about the details here. I installed openSUSE Factory in a virtual machine yesterday and it seems to run pretty great. Of course to really judge a rolling release distribution you need to run it for a sustained period of time. No rolling release distribution will ever be my preferred day-to-day operating system, but nevertheless I’m pretty excited about the “new” openSUSE Factory. I think the changes will enable version whores and bleeding edge explorers to finally have a truly symbiotic relationship with the users who value productivity and predictability in their PC operating system. 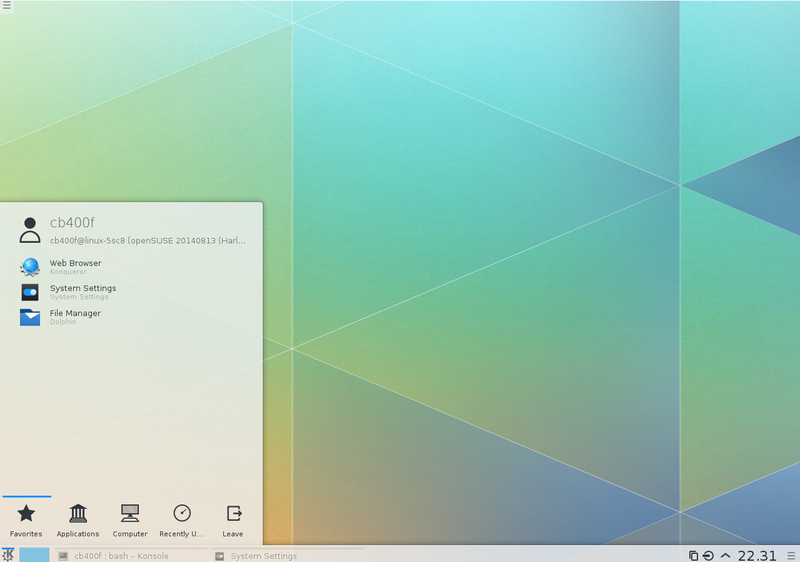 Since I was already testing openSUSE Factory it was a great opportunity to finally get my feet wet with the new KDE Frameworks 5 and Qt5 based KDE Plasma 5 workspace, initially released about a month ago. Obviously it’s still lacking some features and polish, but it’s already usable for forgiving users who know what they’re doing and showing great promise. My provider enabled 4G on my subscription and offered to send me a new SIM Card gratis. So now my Jolla is sporting 4G. Unfortunately it only took about 5-10 minutes of speed testing (peaking at 12 MB/s, averaging about 10 MB/s) to use all my available bandwidth for the month, so for the rest of August I’ve been speed dropped to 64 Kbps, but hey, it’s still 4G! Who’d have ever thought they’d see the day that Stallman would do a presentation with accompanying slides? Well it happened, and I think this great use of slides helps him communicate more effectively. Watch the video and judge for yourselves (27 MB, 13 minutes). KDE Connect is a piece of software that integrates your KDE desktop with Android devices. It enables you to share the clipboard, share files, use your Android device as a mousepad or remote control for MPRIS enabled media players on your desktop, have a battery indicator for your Android device on your desktop and more. Even more features are planned. All this is done over wifi. 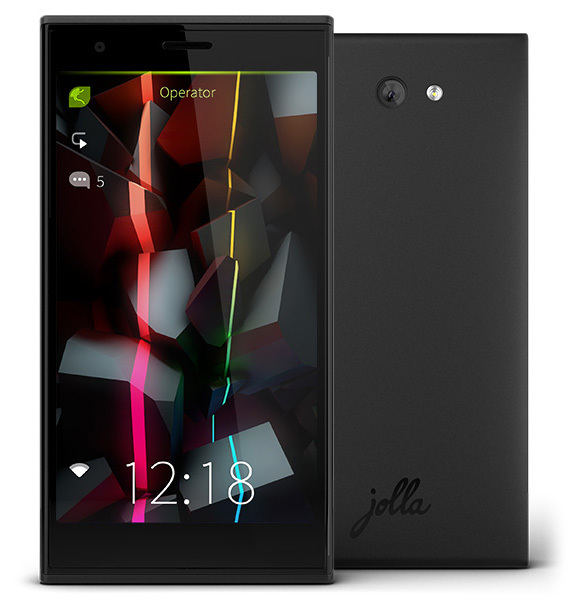 Jolla is of course the coolest smartphone on the market, it runs SailfishOS, but it comes with an Android runtime (Alien Dalvik) which lets you run most Android apps perfectly fine on the Jolla. So I had to see if KDE Connect would work with the Jolla, and at least some of the main features work perfectly. I can now use my Jolla as a wireless mousepad for my KDE desktops, and I can use my Jolla as a remote control for e.g. Amarok. I can also work with the filesystem in the Dolphin file manager, but only the Android runtime folders of the Jolla filesystem are exposed to KDE this way. Quite a few of the features don’t seem to work – notifications, battery indicator, sending files via the Dolphin context menu (right click) and clipboard sharing. 1) Install KDE Connect on your desktop (on openSUSE install the package ‘kdeconnect-kde’ from the KDE:Extra repository. Also install ‘sshfs’ if you want to be able to mount the Android folders on the Jolla in Dolphin. 2) Install KDE Connect on your Jolla (personally I installed the binaries from the F-Droid app store, but binaries are also available in Google Play and 1MobileMarket). 3) Connect your Jolla to the wifi of the same network as your desktop computer and make sure you don’t have a firewall running (or allow traffic for the range of ports 1714-1764 for both TCP and UDP). 4) Launch the KDE Connect app on the Jolla and go to KDE ‘systemsettings’ -> KDE Connect and pair your phone with the desktop.